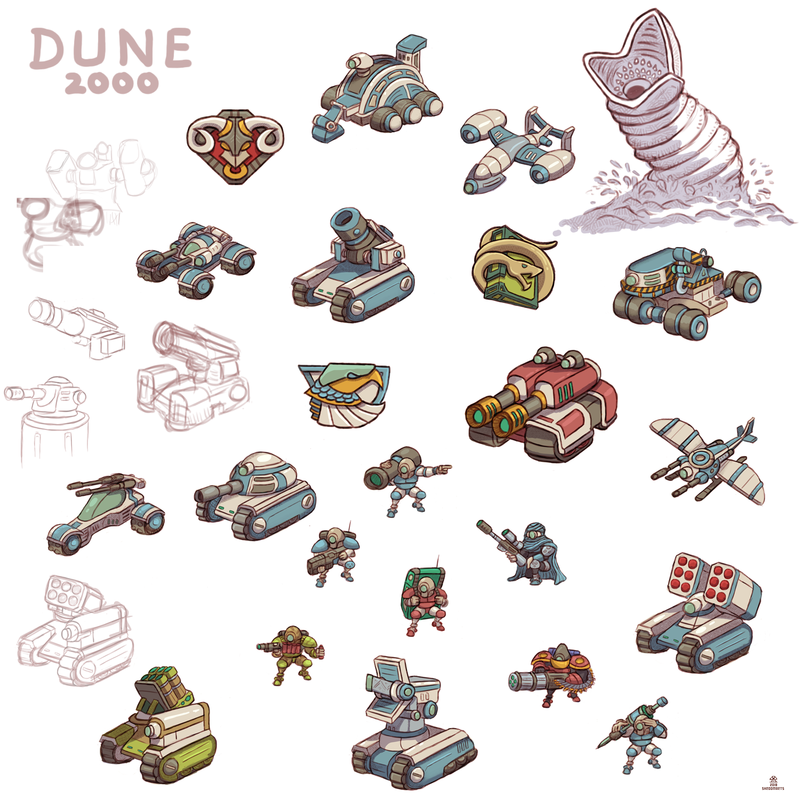 A page filled with Westwood's Dune 2000 units, done while I was feeling nostalgic about 90s rts games. Units from Dune suit right into an advance wars / famicom wars style game. Maybe I should take some time and try to merge the two games together. Removing the base building part and make strategic buildings such as refineries, wind shields, factories, starports etc as neutral structures. Players have to capture these neutral structures to use them. Structures such as refineries will grant the player a harvester to collect spice from sand tiles while barracks and war factories will allow the production of additional ground units, wind traps will allow the player to earn a small daily income while tech centers will allow access to the production more advanced units. star posts can be captured to purchase cheaper but damaged units from the smugglers. I like the spice collecting bit, so when a player captures a refinery, an automated harvester will spawn on the refinery and move automatically to the nearest spice field, harvest it for a few turns, bring it back to the refinery and converts spice into credits. Sand worms should wander randomly (they should probably have their own turn once each player has made their moves) and eat stuff they find.